The book has been endorsed by Stephen Porges, Thich Nhat Hanh, Dan Siegel, Kristin Neff, Paul Gilbert, Harville Hendrix, Geneen Roth, Jack Kornfield, Sara Gottfried, Tara Brach, Bill O'Hanlon, Sharon Salzberg, and many others. (See all the endorsements here.) Using this book, you can beat the brain's negativity bias, which is like Velcro for negative experiences but Teflon for positive ones. This bias evolved to help ancient animals survive, but today it makes us feel needlessly frazzled, worried, irritated, lonely, inadequate, and blue. Instead, in just a few seconds at a time in the flow of daily life, you can turn your experiences - the pleasure in a cup of coffee, the accomplishment in finishing a tricky email, the warmth from a friend's smile - into lasting inner strengths built into your brain, such as resilience, balance, and positive emotions. 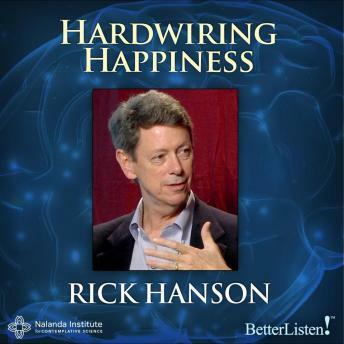 Grounded in neuroscience, Hardwiring Happiness is super-practical, full of easy-to-use methods and guided practices to grow a steady well-being, self-worth, and inner peace. And it has special sections on children, motivation, relationships, trauma, and spiritual practice. The program also covers managing the Stone Age brain for life in the 21st century. It tells you how to take in experiences of your core needs being met, so that you gradually leave the "red zone" of fight-flight-freeze stress and get centered in the brain's "green zone" in which you feel an ongoing ease, fulfillment, and love - even while you deal with life's challenges.